Everyone exploring the backcountry needs water, but staying hydrated is not as simple as drinking straight from streams and lakes. To protect against protozoa, bacteria, and even viruses, there is a wide range of water filtration and purification systems built specifically for backpacking (many options on this list are great for day hiking, trail running, and travel too). Our top picks for 2019 below include everything from ultralight straw filters and chemical drops to pumps and large-quantity gravity filters. For more background information, see our water filter/purifier comparison table and buying advice below the picks. What we like: Filters and stores a high quantity of water effortlessly and quickly; great for groups. What we don’t: Bulky; you need a decent water source to fill the bag. Without a doubt, the Platypus GravityWorks is one of the most convenient water filters on the market, and it’s become a backpacking staple. Instead of pumping, this system requires minimal effort, can filter up to four liters of water at once, and boasts a speedy flow rate of 1.75 liters per minute. 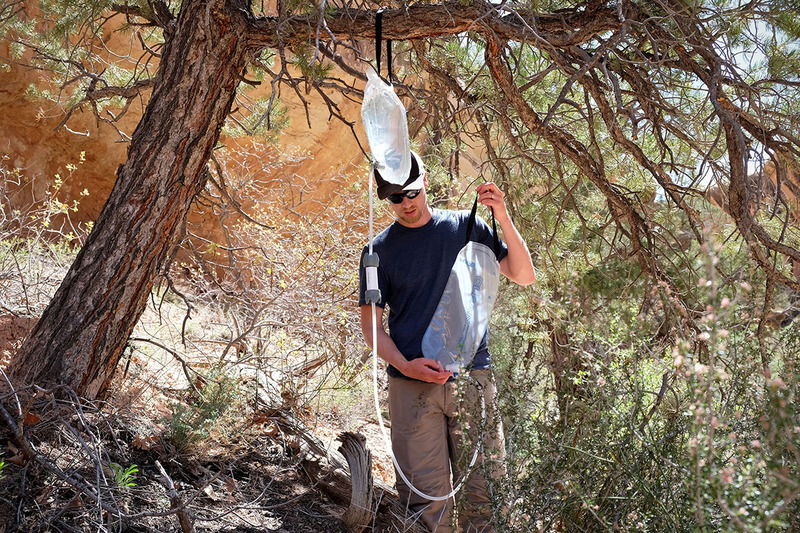 Gravity does all the work: simply fill up the 4-liter “dirty” reservoir, hang it from a tree branch or boulder, and in just a few minutes you’ll have four liters of clean water to drink. This filter is great for large groups, but we’ve enjoyed it on smaller outings too when we could quickly retrieve our day’s water and escape back to our camp to fill individual bottles (the clean bag also functions as water storage). What we like: Light, cheap, effective, and won’t break. What we don’t: Doesn’t filter your water and leaves a faint chemical taste. Gravity filters are great for groups and hand pumps do a nice job of removing debris, but there’s a lot to be said for simple chemical treatment. At just 3 ounces and $15, Aquamira is a liquid chlorine dioxide solution that effectively kills protozoa, bacteria, and viruses. To purify your water, mix 7 drops each of Part A of Part B in the including cap, let it sit for 5 minutes, and add the mixture to 1 liter of water. Then wait 15 minutes before drinking for protection from Giardia, bacteria, and viruses, or a whopping 4 hours to kill Cryptosporidium (that takes a lot of advanced planning). Without a doubt, this system is relatively easy, inexpensive, lightweight, and won’t break on you like some of the more complicated filters and purifiers on this list. Keep in mind that with any chemical purification system, you get zero filtration and therefore will be drinking all of the particles that make their way into your bottle. This generally is fine for clear mountain runoff, but is not optimal for those acquiring water from smaller or more stagnant sources. 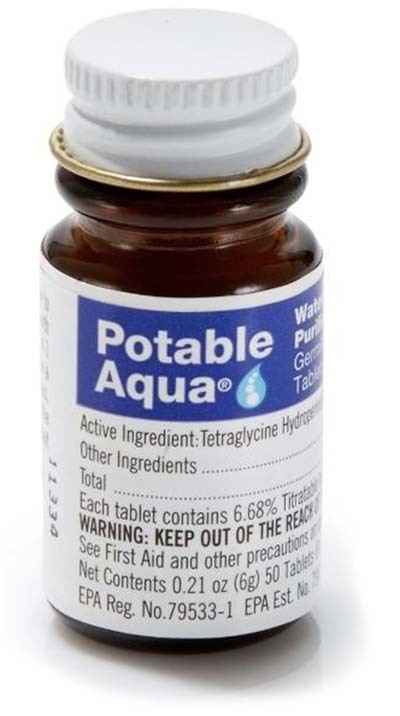 In addition, chlorine dioxide does leave a faint chemical taste in your water, although it’s not nearly as bad as the old iodine tablets (like the Potable Aqua below). 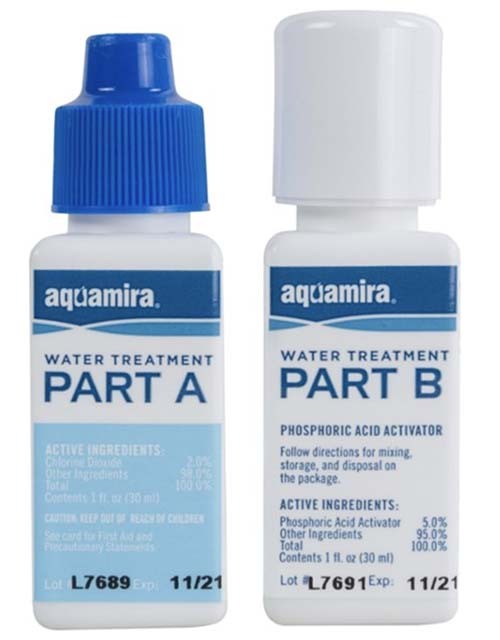 Finally, it’s worth noting that on a recent trip to Patagonia, we opened our Aquamira box and were surprised to find that it contained two Type A bottles (true story). It likely was a freak occurrence and we have not come across other similar reports, but it’s certainly worth checking your bottles before heading out into the backcountry, as is the case with any type of outdoor gear. 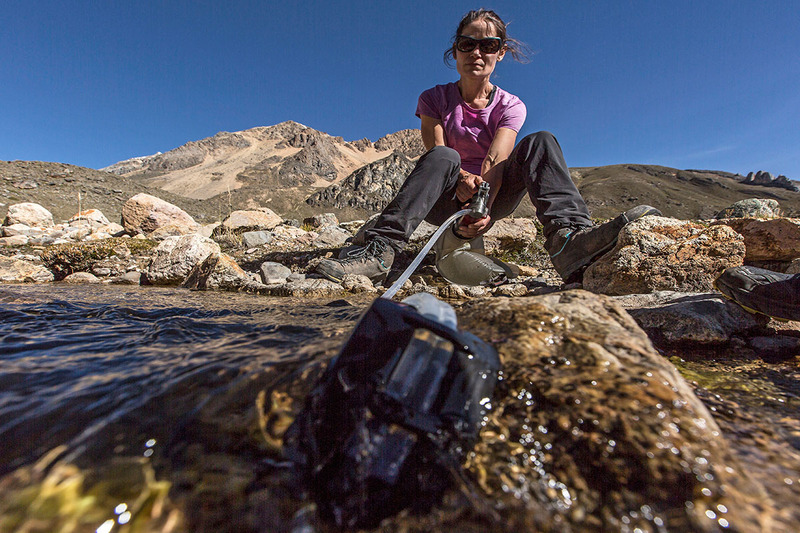 What we like: The most advanced portable water purifier on the market. What we don’t: At $350, the Guardian is the priciest option on this list. We’ll start by acknowledging the steep $350 price tag of the MSR Guardian, but this pump is the real deal. Most importantly, it’s both a water filter and purifier, adding ever-important virus protection to the mix. Whereas other pumps from Katadyn and MSR only protect against protozoa and bacteria, the Guardian provides the ultimate peace of mind when backpacking in high-use areas (viruses are most commonly carried in human waste). In fact, it’s such a reliable and convenient system that the Guardian is now being used as an emergency water purifier after natural disasters and in less-developed countries around the world. Aside from cost, the MSR Guardian is not a small or light system. At just over 17 ounces and packing down roughly to the size of a 1-liter water bottle, this is much more pump than its non-purifying siblings. But it's head and shoulders above the competition in performance and build quality. Not only does it boast advanced self-cleaning technology (the Guardian uses about 10% of the water from every pump to flush contaminants), it’s far less likely to break down than cheaper models. In terms of whether or not you need the purifying capabilities: it’s certainly smart for travel and backpacking in less-developed regions of the world. In Peru, we pumped and drank water from a creek where a full cow skeleton had come to rest and did not get sick. But that said, viruses are less of a risk in the North American and European backcountry, and the Guardian is overkill for most backcountry scenarios. What we like: Super lightweight, fast flow rate, long lasting. What we don’t: More effort than gravity and pump filters. The Sawyer Squeeze epitomizes ultralight water treatment and has been a mainstay on the thru-hiking scene for years. At just 3 ounces, it provides filtered water as fast as you can, well, squeeze. The system works by filling the included 32-ounce pouches with dirty water, then squeezing them into a clean bottle or reservoir, a pot for cooking, or straight into your mouth. For those moving fast and light, it’s a simple option for day hiking and backpacking, provided you know the location of river crossings or other water sources (or carry additional bottles along for storage). And with a 1-million-gallon guarantee, Sawyer doesn’t even make replacement cartridges for this filter. This streamlined water filtration system does have its downsides. First and foremost, as with the GravityWorks above, collecting water with the included pouches can be challenging if your source is shallow or not moving quickly. Second, squeezing a liter of water is more effort than letting a gravity filter do the work (Sawyer does include an adapter for converting the Squeeze into a gravity filter, which is nice). For those who want to go even lighter, Sawyer offers a “Mini” version described below, which is just 2 ounces and $20 but isn’t as good in terms of flow rate and longevity. And there’s also the Micro Squeeze, which comes with a 32-ounce refillable pouch (the Mini comes with a 16-ounce pouch), weighs less than 2 ounces, and has an improved flow rate compared to the the Mini. What we like: A versatile and reliable filter that can make clean water from puddles. What we don’t: Relatively short filter life and pricey to replace. Pumping water has its downsides, but we’ve found that the Katadyn Hiker is one of the most reliable filter options across a wide range of backpacking scenarios. Simply put, you break out your Hiker, place the hose end in the water, screw the other end onto your Nalgene (or hold it over top if you have a different type of bottle or reservoir), and pump. 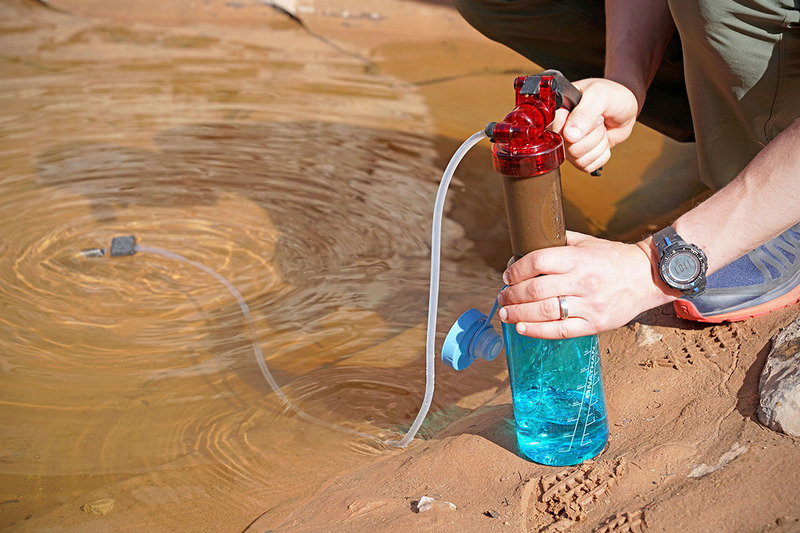 You get roughly one liter of clean water per minute if you’re pumping at a good clip, and we’ve found that the Hiker Microfilter works faster and is easier to use than the MSR MiniWorks below. Unlike the MSR Guardian, however, the Hiker is a filter but not a purifier, so you don’t get virus protection. In terms of construction, the Katadyn Hiker is well built for a pump but these systems are not infallible. The device is made of ABS plastic and has a number of hoses and small parts, and we’ve had pieces snap off of other pumps in the past (not with the Katadyn yet, but it certainly can happen). Another downside is the rather pricey replacement filter: after approximately 750 liters, you’ll need to spend $50 for a new one (the MSR MiniWorks recommends a replacement filter after 2,000 liters and that costs $40). But we still prefer the Katadyn, which despite the shorter filter life, has faster and smoother pumping action. 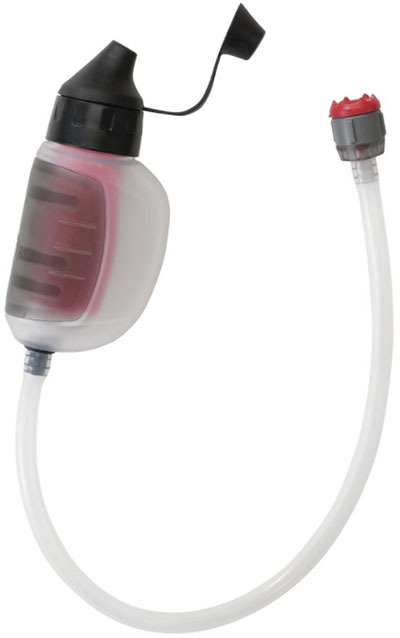 What we like: The smallest and lightest pump filter available. What we don’t: Other options serve the same fast-and-light purpose. 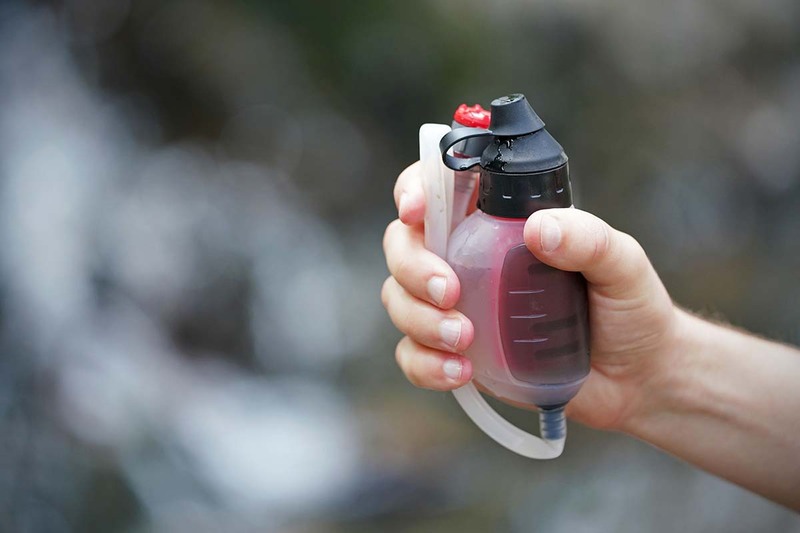 At a weight that’s less than half of Katadyn's Hiker above and size small enough to fit in your pocket, the TrailShot is a great on-the-go filtration system for trail running and day hiking. This minimalist, one-handed pump allows you to filter water without laying on the ground (such as with the LifeStraw) or getting cold hands by filling up and squeezing bottles (such as with the Sawyer Squeeze or Katadyn BeFree). Additionally, it works well in shallow pools or streams, which is a weak point of many squeeze and gravity systems. And with the ability to filter about 1 liter per minute, the TrailShot keeps up with the competition in terms of speed. Despite weighing only 5 ounces, the MSR TrailShot is among the heaviest of the ultralight filters on this list. Additionally, it’s somewhat slow to use compared to more serious pumps, particularly in dirty water, meaning that it should not be your primary option on full-on backpacking trips (and especially in a group). Overall, we think that other products above like the Sawyer Squeeze serve the fast-and-light functions better, but if you’re a fan of pump filters and looking for a lightweight option, the TrailShot is a nice choice. What we like: Extremely light and simple. What we don’t: Despite being safe, you’re drinking unfiltered water straight from the source. Similar to the Aquamira drops above, Katadyn Micropur tablets are a simple and effective chemical treatment using chlorine dioxide. For backpackers, there is a strong argument for going this route: the tablets weigh less than one ounce for 30, making them by far the lightest water purification option on this list. In addition to that low weight, each tablet is individually wrapped and therefore can be modified for the specifics of your trip (Aquamira technically could be emptied to shave fractions of ounces, but you have to carry the bottles either way so it’s not nearly as practical to customize). In order to use the Katadyn, just add one tablet to a liter of water, wait 15 minutes for protection from viruses and bacteria, 30 minutes for Giardia, and 4 hours for Cryptosporidium. The biggest downside of any tablet or chemical is that despite the water being clean, it’s still unfiltered (in Utah, for example, that may mean brown water with lots of critters). But in areas with relatively clear mountain water like the Sierra or Pacific Northwest, chemical treatments are an excellent option. 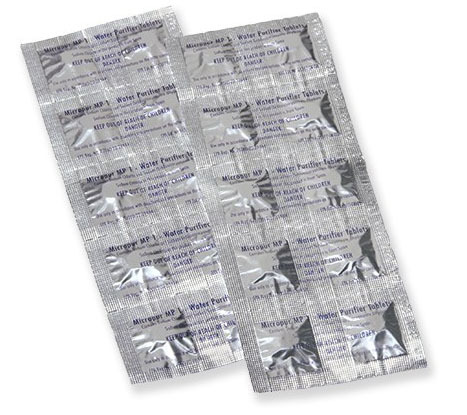 Other things to keep in mind with Micropur tablets are that the tablet can be chalky and broken up inside in the packaging, especially with rough use, and some hikers may want to add a separate receptacle for protection. Last but not least, these tablets also have a slightly chemical taste, and take longer than the Aquamira above for certain protections (30 vs. 20 minutes for Giardia, in particular). Overall, both are excellent purification options for minimalists and those on a budget. What we like: Effortlessness of a gravity system combined with the convenience of a hand pump. What we don’t: Heavier than the Platypus GravityWorks and slower to filter. You won't find a more versatile water filtration system than the new MSR Trail Base. Combining a gravity filter system with the TrailShot hand pump above, MSR created a unique combination that works well whether you're at basecamp or on the trail. Like the Platypus GravityWorks, our top pick, the Trail Base comes with two reservoirs—a dirty and a clean—which hang and cycle water to the clean reservoir by way of gravity. 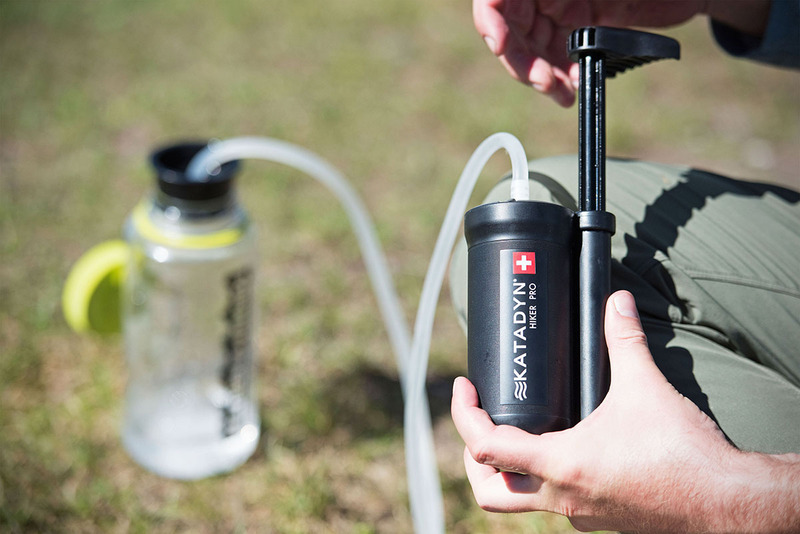 Unlike the Platypus, the filter on the Trail Base easily disconnects and doubles as a fully-functional hand pump (the TrailShot) for water on the go. Furthermore, the clean reservoir works great for carrying water, eliminating the need for bulky water bottles. This multi-function design makes the Trail Base an attractive option for basecampers and backpackers who want easy access to water during the day. However, all this versatility comes with a cost. 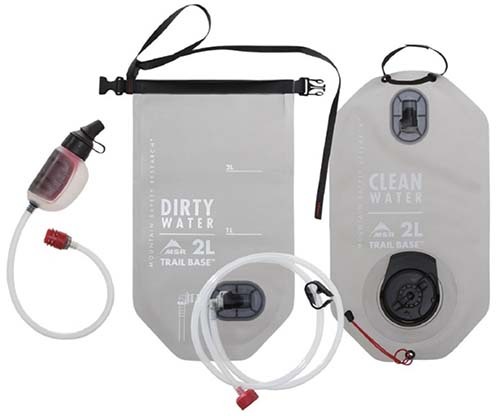 First, the Trail Base is a bit cumbersome as a gravity filter, cycling only 1 liter of water per minute (the GravityWorks filters 1.75 liters per minute). Second, the system weighs a hefty 16 ounces, significantly more than the 11.5-ounce Platypus (which notably is a 4-liter system). Keep in mind that for the weight, you do get a gravity filter, squeeze hand pump, and drinking reservoir in one, which is quite impressive. Sawyer offers similar versatility with their 8.8-ounce Gravity System that incorporates the Squeeze, but it's a less convenient design with just one reservoir. 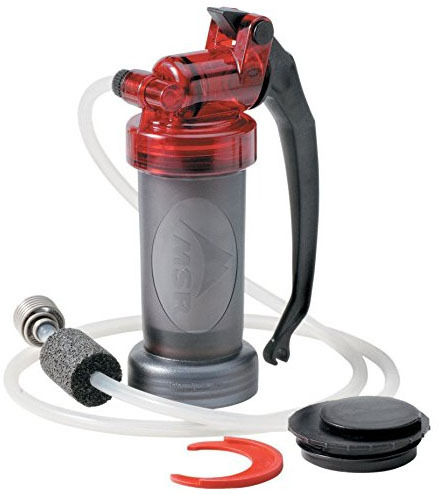 And for a simpler gravity setup, check out MSR's updated 10-liter AutoFlow XL. What we like: Lightweight and inexpensive purification. What we don’t: Relies on batteries/USB charge. For more than 15 years and counting, SteriPen has held a unique place in the water purification market. Instead of the various gravity filters, pumps, and drops on this list, the Adventurer Opti uses UV rays to destroy bacteria, protozoa, and viruses—a full purification process at less than 4 ounces total for the unit. It takes about 90 seconds to purify 1 liter: you simply place the SteriPen in your water and swirl until the light turns green. Keep in mind that the SteriPen does not filter your water, and therefore you’ll want a good source. We love the concept of the SteriPen, but have mixed feelings after extended use. The lack of filtration certainly is a downside, and means that unless you don’t mind silt and other particles, you’re limited to moving water sources of a decent depth. Second, the SteriPen runs on two CR123 batteries, and if those run out and you don’t have backup, you’re stuck in the wilderness with no purification. Finally, when using the SteriPen, we just can’t help but feel like we are doing something wrong. Did we submerge the device too little or too much? Is the process actually working? These are just our insecurities and we’ve never been sick after using a SteriPen, but it is something that comes to mind. For those who prefer USB charging, the SteriPen Ultra weighs 5 ounces total including a rechargeable battery and costs $100. What we like: Great as an emergency backup or if you’re truly counting every ounce. What we don’t: Cannot fill bottles and requires getting down at water level to drink. 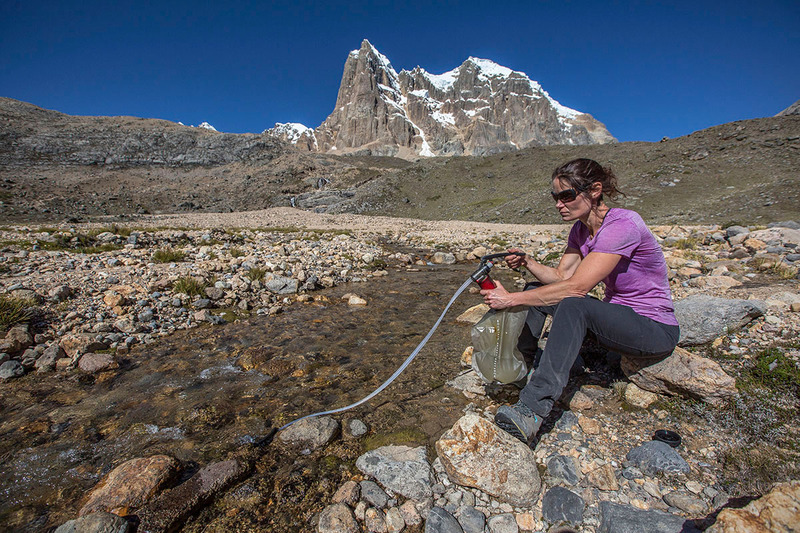 The big downside of the LifeStraw is that it cannot be used to fill bottles and therefore is not a plausible filtration system for backpacking or group settings. And unless you’re trying to go as streamlined as possible, there aren’t many situations where you’d choose the LifeStraw over the convenience of the Sawyer Squeeze, Katadyn BeFree, or droplets. In addition, using the LifeStraw means getting down on the ground just a few inches from your pool of water to drink, the novelty of which wears off rather quickly. But you can’t knock the weight, price, or simplicity, which is why the LifeStraw is a viable filtration option. What we like: One of the few pump designs with a ceramic filter. What we don’t: Heavier and slower than the Katadyn Hiker. Despite all of the recent innovations and newer releases like the TrailShot, the MSR MiniWorks remains one of the most popular pumps on the market. Compared to the Katadyn Hiker above, both are similar in price (the Katadyn is $15 cheaper), have the same filter pore size (.2 microns), and protect against the same things including Giardia and Cryptosporidia. The Katadyn is lighter at 11 ounces, but the MSR has a significantly longer filter life at 2,000 liters (the MSR is carbon/ceramic while the Katadyn is carbon). And both allow you to filter water without the inconveniences of straws or droplets. We have the MSR MiniWorks ranked here because of our personal experience with it. We found the pump to be slow from the outset (it has a listed flow rate of 1 liter per minute, but we didn’t experience that). Further, our version became almost unworkable mid-way through a Utah backpacking trip. The water was rather murky, but that’s no excuse for pump failure just a few days out of the box. User reviews generally are positive and we are looking forward to getting another MiniWorks out this summer for more testing, but regardless, we’ll take the lower weight and initial cost of the Katadyn. What we like: Feathery light. What we don’t: We’ll stick with the better performing and longer lasting Sawyer Squeeze. One ounce lighter and $20 cheaper than the Sawyer Squeeze above, the Sawyer Mini is one of the lightest and most compact water filters on the market. Like the Squeeze, the Mini attaches to its included bag or other compatible water bottle to squeeze filtered water into your mouth or drinking vessel. Unlike the Squeeze, however, the Mini doubles as a straw, giving it the versatility of a bottle, straw, or gravity filter (the gravity option requires purchasing extra components). It shouldn’t come as a surprise that this smaller and less expensive version is slower to filter and more prone to clogging. Additionally, the Mini is lighter on accessories: the 16-ounce pouch isn’t as useful for filling up standard water bottles, and you have to pay extra for attaching it to a hydration reservoir or converting the Mini into a gravity system. Taken together, we think the Squeeze is worth the extra one ounce and 20 bucks. 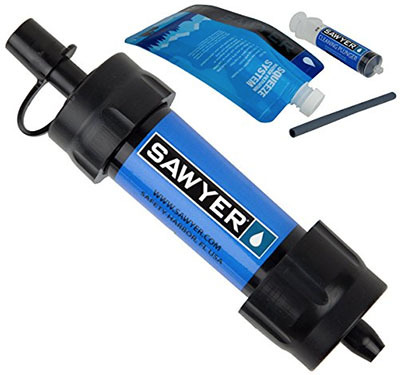 But if you’re looking for the absolute lightest filter out there, the Sawyer Mini ties with the Lifestraw for that distinction and functions well as an emergency backup. What we like: Extremely light and great for on-the-go hydration. What we don’t: Less versatile than the Sawyer Squeeze. The ultralight water treatment market is expanding, evidenced by the relatively new MSR TrailShot and the resurgence in popularity of chemical treatments. Designed to go head-to-head with the popular Sawyer Squeeze above, the BeFree is another solid option in this category. Instead of squeezing, you drink directly from the ultralight straw filter. Compared to the Sawyer, the Katadyn is lighter at just 2.3 ounces, more packable, easier to use, easier to clean, and has a wider mouth from which to fill. This feature set makes the Katadyn a nice choice for trail runners, mountain bikers, and day hikers. Why is the Katadyn BeFree ranked here? First, it has a relatively short lifespan compared to the Squeeze (1,000 liters vs. the Sawyer's claimed 1 million gallons). Second, the BeFree filter only is compatible with bottles with a 42mm mouth, so it’s not as versatile as the Sawyer which fits a variety of standard 28mm water bottles. Third, we definitely noticed a faint plastic taste when using the bottle, which has been the case with other Hydrapak products (the bottle is BPA free, but nobody wants their water to taste like plastic). Finally, the Katadyn is $5 more plus the potential cost of a new filter ($25) and lacks the versatility of the Sawyer’s gravity adapter. But the BeFree wins out for ease of use, and its lightweight and compressible design earns it a spot on our list. What we like: An innovative and simple purification system. What we don’t: Not a versatile design (one bottle per person). The Grayl Ultralight Water Purifier is a relatively new product designed with travel and light adventuring in mind. We like the concept, which replaces the myriad awkward devices on this list—all of which require some level of squeezing, pumping, batteries, hoses, or even chemicals—with a simple and sleek 16-ounce bottle. The Grayl is available in a variety of colors, offers purification on top of filtration, and has a nifty French-press-style plunger to get the job done. Though catchy and certainly useful for a wide range of scenarios (think traveling in lesser-developed countries or hydrating in camp), the Grayl has limitations. Purifying just .5 liters at a time, this would be a rather inefficient system for anything but on-the-go drinking when water sources are consistently available. Additionally, the purifier cartridge has a lifespan of only 150 liters, lower than any other filter or purifier on this list. That said, we really like the Grayl for traveling abroad, and it’s a great replacement for buying water in disposable plastic bottles. For backpacking, the practicality is limited. What we like: Can filter 60,000 liters with little upkeep. What we don’t: Less convenient than other chemical purification options. Now for something a little different: Potable Aqua’s Pure Electrolytic Water Purifier. 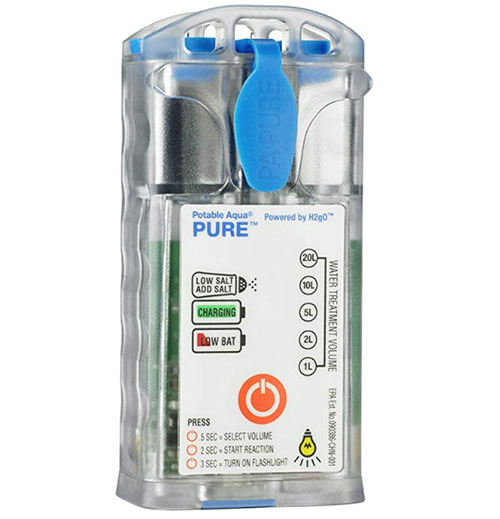 Unlike most chemical purifiers that use chlorine dioxide or iodine, the Pure combines salt water and an electric charge to remove contaminants from water. This technology is more common in military and municipal applications than the outdoor world, although we’ve even seen it before with MSR’s now-discontinued Miox. In general, it’s a simple, lightweight set up that can purify 1-20 liters at a time, boasts a lifespan of 60,000 liters, and charges (slowly) using the attached solar panel. The Pure Electrolytic comes with the same downsides of nearly all chemical treatment options. It adds an unfortunate taste, takes a half hour to do its job (or 4 hours if you’re worried about Cryptosporidium), and does not remove floaties like a filter would. And as with every form of water treatment that uses power, we recommend bringing a backup option into the field in case the Pure malfunctions. All told, the Pure is intriguing, but it isn’t our favorite chemical purification option—we’ll stick with the more reliable chlorine dioxide for most applications. What we like: A filter that fits onto your favorite water bottle. What we don’t: The straw attachment could be more secure. LifeStraw keeps innovating in water filtration and purification, and the new Universal is case in point. Like the Sawyer Squeeze or Katadyn BeFree, the LifeStraw attaches onto a bottle, filtering water as you drink. But unlike other bottle filters, the LifeStraw Universal comes with two different cap sizes to fit onto wide or narrow-mouth bottles. Furthermore, it stands out from the competition with an integrated carbon filter that reduces chemical matter and improves the taste of the water. For someone on the road or in areas where you don’t want to drink the water straight out of the tap, the Universal very well could be a top choice. But for lightweight backpacking, it’s less appealing. First off, the filter takes up valuable space inside the bottle. Further, we’ve heard complaints about the straw detaching from the lid. 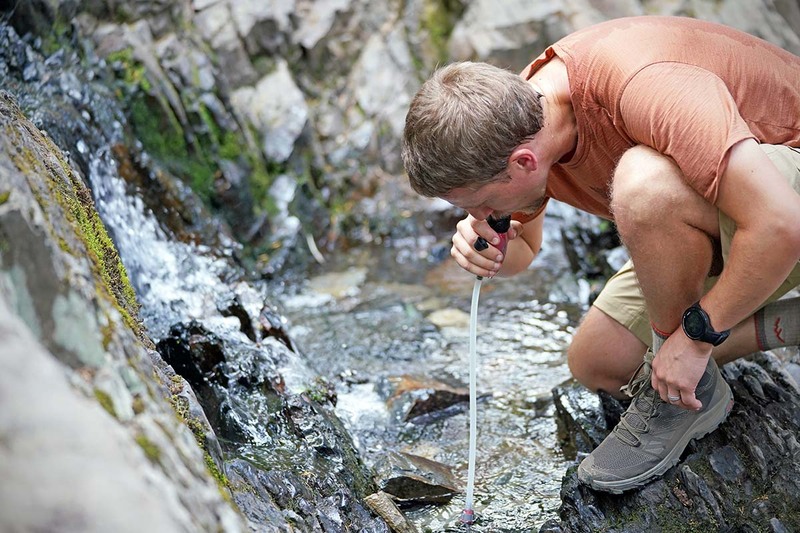 It’s undoubtedly a cool piece of technology and functions well for travelers, but the LifeStraw is not one we recommend for the backcountry. What we like: Lightweight and cheap. What we don’t: Tastes funky and takes 30 minutes to activate. Potable Aqua tabs are a classic and a method that we’ve used as a filter backup for years. The system couldn’t be simpler: put two iodine tablets in a liter of water, wait 30 minutes, and drink. Most importantly, they kill bacteria, protozoa, and viruses, thereby purifying water for drinking. Similar to the Aquamira drops, Katadyn tablets, and SteriPen above, keep in mind that you will be drinking unfiltered water, so Portable Aqua is best used with relatively clean mountain water. The big downside of Potable Aqua is taste. Neutralizer tablets are available and do a decent job of masking the chemical flavor, and many people add a drink mix to make a tastier concoction. If you’re wondering about the differences between iodine (Potable Aqua) and chlorine dioxide (the Katadyn and Aquamira above), the former is not effective in killing Cryptosporidium, while the latter is categorized by the CDC as having low to moderate effectiveness. Further, the Katadyn and Aquamira don't have as many issues with taste, which is why they land higher spots on our list. Sawyer Squeeze $40 Bottle/gravity filter 3 oz. 1 million gallons 1.7 L/min 32 oz. 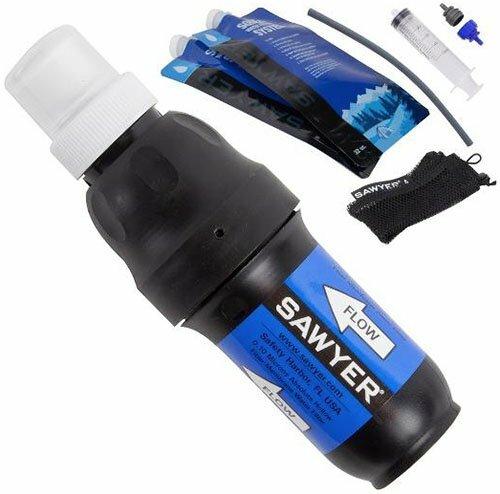 Sawyer Mini Filter $20 Bottle/straw filter 2 oz. 100,000 gallons Unavailable 16 oz. Grayl Ultralight Bottle $60 Bottle purifier 10.9 oz. 150 liters .5 L/15 sec 16 oz. These two terms are often used interchangeably, but water filters and purifiers are not, in fact, the same thing. The largest difference between a water filter and a water purifier is in the level of protection against microorganisms that they provide. In general, filters protect against protozoa and bacteria, while purifiers add viruses to that mix. Water filters take the form of cartridges with tiny microscopic pores that physically strain out harmful elements. Microorganisms that are large enough to be stopped by filters include protozoa (such as the notorious Giardia) and bacteria (such as E. Coli and Salmonella). Water filters do not, however, protect against viruses (Hepatitis A and the Norovirus, for example). The current consensus is that filtering your water should be sufficient for the United States and Canadian backcountry. Viruses, which are transported primarily by human waste and occasionally animal waste, are rarely found in glacier melt or moving streams. But as we will say a number of times in this article, virus protection certainly isn’t a bad thing, even in North America. It’s better to be safe than sorry. Like water filters, purifiers remove protozoa and bacteria from water, but they also combat viruses too small for most filters. This takes place either through the use of chemicals, ultraviolet light, or tiny fibers such as those used in the MSR Guardian. Purifiers are essential to obtaining drinking water in less-developed regions of the world where water sanitation and infrastructure aren’t as robust and viruses may find their way into the water. Most water purifiers do not filter sediment or other particles from the water, so in some cases the combination of a water filter and a water purifier might be necessary. The pricey MSR Guardian is the exception here—it functions as a pump filter, yet water runs through fibers so microscopic that viruses are kept from passing as well. 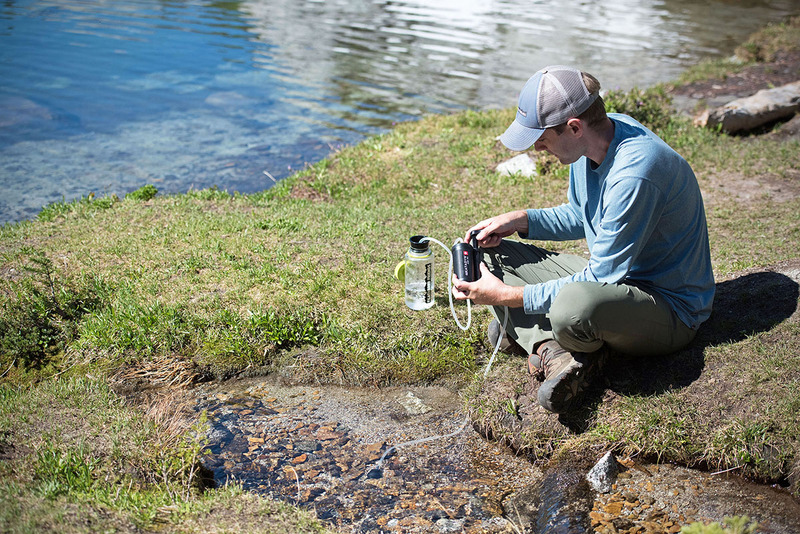 Gravity filters are the fastest and easiest way to get clean water in the backcountry, provided you have a decent source from which to collect. You simply connect the parts, fill up your dirty water bag, hang it from a tree branch or rock, and let gravity do the work. Instead of pumping, water flows downward through the filter and into a separate reservoir for drinking. 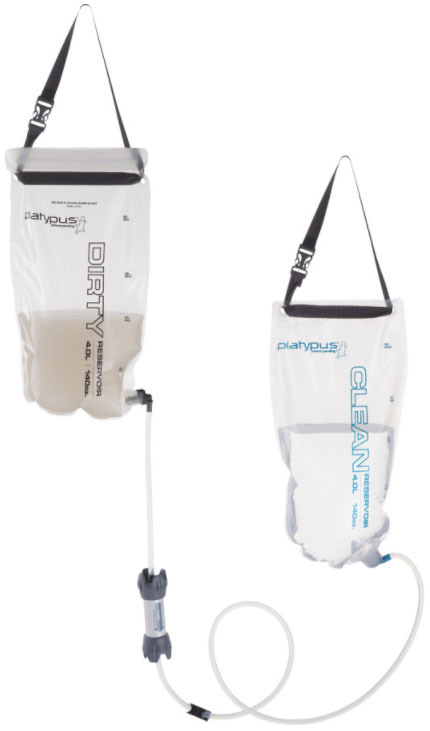 Gravity filters are awesome (our top overall pick in this article is the Platypus GravityWorks) as they treat large amounts of water without the arduous task of pumping, and dispense it easily. Because of the volume of water they can treat, gravity filters are a great choice for backpacking in groups and basecamping. There are a couple of downsides of gravity filters. First, the parts can be somewhat bulky as the system includes at least one bag (dirty water) and often two (the clean water bag technically is optional as you can filter directly into bottles), the hoses, and the filtration unit. If you’re looking for the smallest and lightest setup for backpacking, a number of minimalist straw filters, hand pumps, and chemical treatments can achieve those goals (see the Sawyer Squeeze, to start). And using a gravity filter does require scooping water into the dirty bag, which is best done from at least a moderately-sized stream or pond. You’ll also need a place to hang the clean water bag to let the filter do its work, unless you want to hold it at head level as the water filters downward. When you hear the term “water filter,” a pump probably comes to mind. Pump filters have long dominated the world of backcountry water filtration, only recently being overshadowed by new technology like gravity and bottle filters. A pump filter uses the action of—you guessed it—pumping to siphon water from the source, through a hose, into a microscopic filter, and out another hose into a clean receptacle. 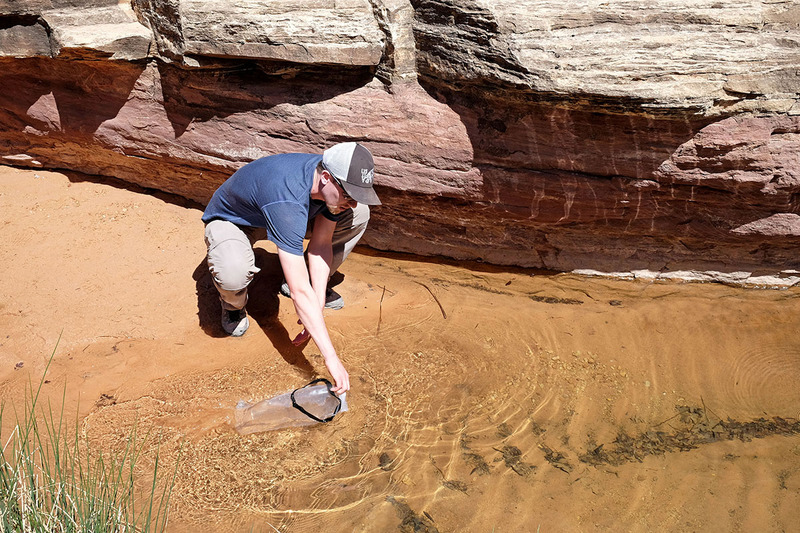 Pump filters, unlike gravity filters, are great for using on the trail to filter a liter or two while hiking, and are adept at pulling water from shallow sources (we depend on them in Utah where it’s often difficult to scoop large quantities). However, filtering water with a pump can be arduous, field maintenance often is required to clean the cartridges, and pump filters are among the heaviest water filtration systems (MSR's 5-ounce TrailShot is one exception). Two of the leading pump filters in 2019 are the Katadyn Hiker and MSR MiniWorks, and the MSR Guardian is in a class of its own as a pump purifier. As the name indicates, these filters attach to the spout of a bottle and filter water as you drink. Most often, the bottle must be soft sided (like a disposable plastic bottle or the pouches that accompany the Sawyer Squeeze), as transporting the water to your mouth typically requires a squeezing action. We love these filters for their versatility—in addition to drinking straight from the bottle, you can filter water into a separate receptacle for storage. But they are often slower at filtering than a high-performing pump design and require quite a bit more effort than a gravity model. That said, their lightweight and compact build make them popular among long-distance backpackers, day hikers, and cyclists. In addition to filtration options, one bottle purification system made our list: the Grayl Ultralight. This all-in-one set-up includes a French-press-style plunger that functions both as filter and purifier, allowing you to treat your water and then sip normally. However, the Grayl has a small capacity and short filter life, making it best for traveling in developing countries when water sources are readily available and purification is needed. Used commonly by day hikers, trail runners, and mountain bikers who prefer not to carry water as they move, straw filters allow you to drink directly from the source. They use the pressure of sucking to transport water from a stream, lake, or bottle, through the filter and into your mouth. On average, straw filters are lighter and cost less than pump or gravity filters, but they are functional in limited environments, such as when water is readily available and no storage of water (for cooking or drinking later, for example) is needed. 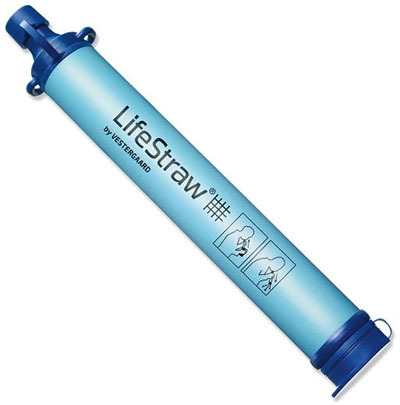 One of the most well known straw filters is the basic LifeStraw. We hesitate to call them old school, but chemical purifiers have been around forever yet still get the job done. Perhaps the most well known chemical system is Potable Aqua iodine tablets, which you simply add to water and wait 30 minutes before drinking. The upsides are clear: tablets are lightweight and cheap, not to mention you get decent virus protection too. But keep in mind that tablets and similar chemical options like Aquamira chorine dioxide drops go straight into unfiltered water. This means that whatever amount of silt, twigs, and critters are in that water will be in your bottle too. For this reason, tablets and drops work best when you have easy access to good water sources like glacial streams. A final note on chemical purifiers: taste often can be an issue, especially with iodine. Potable Aqua does come with neutralizer tablets, but it’s hard to avoid that chemical taste. One purification system on this list, the SteriPen Adventurer Opti, uses unique UV purification methods. In terms of process, you place the SteriPen in your water and swirl for about 90 seconds until the light turns green (it may take more time if the water is very cloudy or cold). Similar to the chemical purifiers listed above, the SteriPen goes directly into unfiltered water and therefore you’ll want a good source. Another downside of UV purification is that it requires batteries and electronics to work, which can go dead or otherwise fail in the backcountry. For this reason, we recommend bringing backup batteries and/or options such as drops or tablets (in fact, this always is a good idea no matter your system). As with all backpacking gear, the goal is to go as light and small as possible. The good news is that with water filtration and purification, now more than ever there are a number of super lightweight and packable options. It all starts with chemical droplets and tablets, which are around 3 ounces total (or 6 ounces for iodine if you bring the taste neutralizing tablets) and take up almost no space in your backpacking pack. There also are ultralight straw filters like the LifeStraw and Katadyn BeFree, which weigh in the 2 to 3-ounce range but are slightly larger in size than chemical treatments (although the Katadyn includes a water bottle). Pumps and gravity systems take up the most space and are the heaviest, ranging from around 11 ounces for the Katadyn Hiker to 17 ounces for the MSR Guardian. These systems also have multiple components including storage bags and hoses, but work great for groups and basecamping. A key product specification that we reference in this article is filter life, or how quickly your filter will need to be replaced. The primary consideration here is cost: you have the initial purchase price of the device, but after a certain number of liters of water have been filtered, you’ll need to buy a replacement cartridge. For example, two of our favorite pump filters are the Katadyn Hiker and MSR MiniWorks. 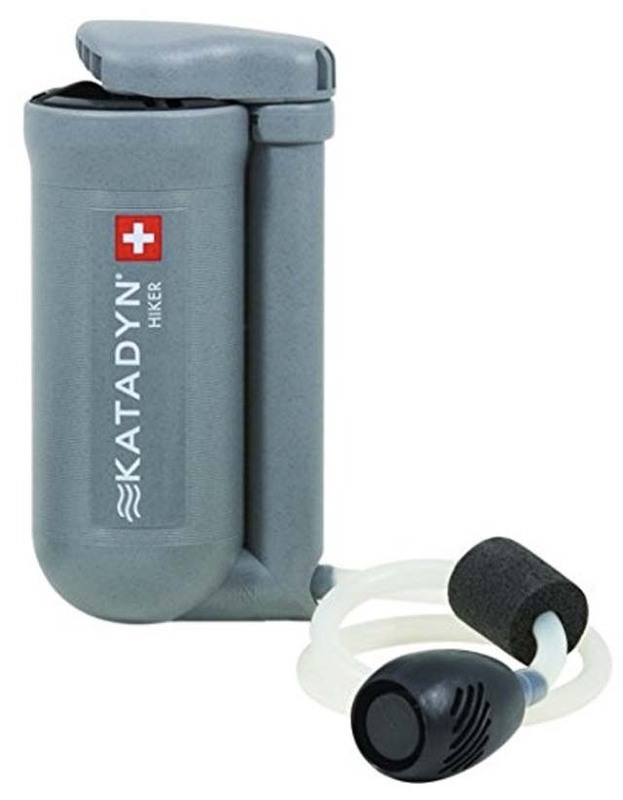 The purchase price of the Katadyn is $15 less than the MSR, but it has a shorter filter life of 750 liters vs. 2,000 liters. Given that the Katadyn replacement filter costs $50 vs. $40 for the MSR, this brings the cost of the system up over a period of years. On the extreme ends of the spectrum, the Grayl Ultralight purifying bottle has a cartridge life of only 150 liters, while the Sawyer Squeeze has a 1-million-gallon guarantee and they don’t even make replacement cartridges for it. As with any manufacturer-provided spec, the listed filter life is optimistic and probably should be thought of as a maximum. Furthermore, many of these filters and purifiers are made with a great deal of plastic and it’s fairly likely that you’ll break another component of the device before the filter expires. Finally, keep in mind that the 750 liters referenced above for the Katadyn is actually a lot for most casual backpackers that get out a few times a year. If your filter lasts that long and you’re ready for a new cartridge, then you’ve gotten a lot of use and clean water out of it, making it a solid investment. 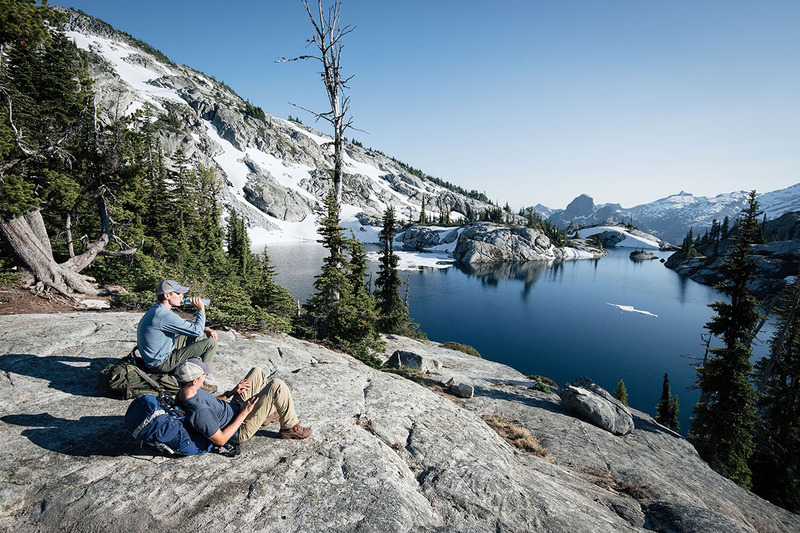 In practice, you’re most likely to drink adequate amounts of water in the backcountry if it’s quick and easy to obtain. Thus, flow rate, or the speed of your filter, matters. Gravity filters generally have the fastest flow rates­—both the Platypus GravityWorks and MSR AutoFlow XL are 1.75 liters per minute, which means they only takes a few minutes to fill a 4-liter bladder with clean water. The leading pump filters on the market are listed at about 1 liter per minute, although that seems fairly optimistic to us. The exception is the pricey MSR Guardian, which is listed at a speedy 2.5 liters per minute. Although not technically flow rate, chemical purifiers take between 20 and 30 minutes depending on the product of your choosing. Again, the flow rates listed by the manufacturers are going to be realized in optimal circumstances and are likely to be slower in the field. Most filters come with recommendations for backflushing or light maintenance to keep things moving properly (more on that below). If you’re getting deep into water filter/purifier research, you may come across the term “pore size,” which is measured in micron. This refers to the size of the tiny openings in the filter, and the smaller they are, the more particles the filter can block. According to the CDC guide on water treatment, microfiltration units range in pore size from approximately 0.05 micron to 5 micron. Many backpacking filters on this list have a pore size of .1 or .2 micron, which is effective against protozoa (Cryptosporidium, Giardia) and bacteria (Salmonella, E. coli, etc. ), but not viruses (Hepatitis A, Norovirus, etc.). 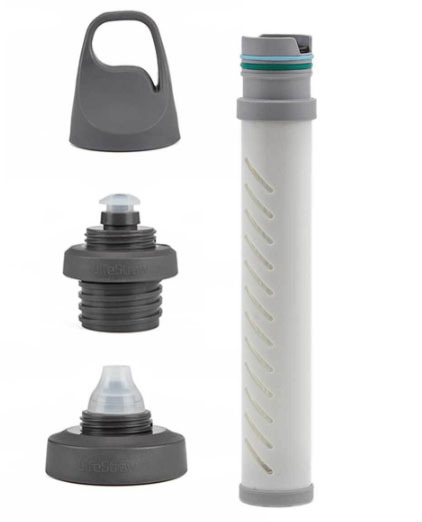 The MSR Guardian is unique in terms of being a pump purifier due to the medical-grade fibers used in the filter. Almost all water treatment systems have some way of connecting to either a water bottle or hydration reservoir, if not both. This often takes the form of a simple hose or cap that fits onto commonly-sized water bottle openings. 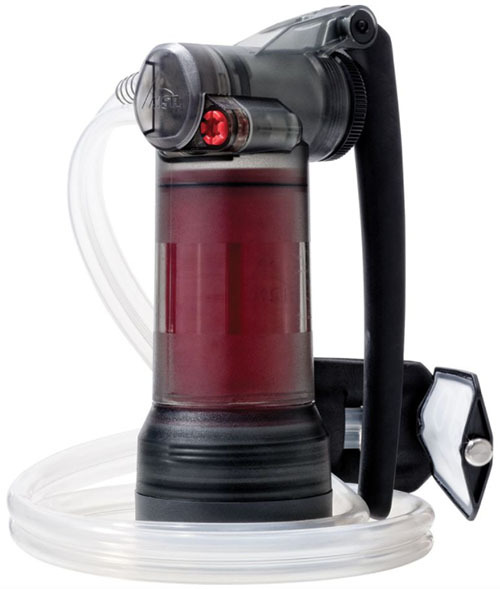 The new MSR Trail Base, for example, has a tube that can connect with MSR reservoirs for a streamlined gravity system, and pump filters like the Katadyn Hiker and the MSR MiniWorks have adapters that fit the mouth of a standard Nalgene bottle. Sawyer has played into the fast-and-light community of hikers who use disposable plastic water bottles on the trail, making their Squeeze and Mini versions able to screw into the mouth of a standard plastic water bottle (great for weight savings, less great for the environment). All in all, be mindful of the compatibility for a water filter or purifier to make sure it works with your drinking vessels. Many water filters and purifiers are able to remove bacteria, protozoa, and sometimes even viruses, but they won’t necessarily change the taste of the water. This isn’t a huge issue when you’re drinking straight from cold mountain streams, but it definitely can be as the quality of your water source deteriorates. If you’re using chemicals to purify your water or drinking from questionable sources—perhaps water with floating leaves or plants growing underneath the surface—taste can come into play in a big way. If the bad taste really bothers you, we recommend adding an electrolyte-enhanced drink mix, or in the case of Potable Aqua, using the accompanying neutralizing tablets. In addition, carbon filters are known for helping with taste. Used in the popular Brita kitchen filters, carbon removes chlorine, organic compounds, and other bad odor and taste-inducing materials. Not all portable backcountry filters use carbon, but many on our list do including the MSR MiniWorks, LifeStraw Universal, and Grayl Ultralight Purifier. Additionally, some models offer carbon filters as add-ons: the Platypus GravityWorks, for example, sells a carbon element separately that can be added to the existing filter, and the LifeStraw Steel edition uses carbon instead of a hollow-fiber membrane. It’s important to note that carbon becomes ineffective before the filter (after approximately six months or 200 liters), so if this is a feature you want to maintain, choose a filter that allows you to purchase the carbon element separately from the complete cartridge. Given that their task is to remove contaminants from water, it should come as no surprise that many water filters need to be cleaned of this buildup. Most gravity and straw filters are maintained by backflushing clean water or air through the filter. With the LifeStraw, this is as easy as blowing out after each drink. Others require a separate piece of equipment, including the syringe that comes with the Sawyer Squeeze. In general, it’s important to read about and practice maintaining your filter at home before taking it out into the field. Cleaning pump filters is a slightly more intensive process, as you'll need to unscrew the apparatus and either remove the filter or extend a brush down the interior. Instructional videos are available online for almost every product on our list, and you should expect basic maintenance to be part of owning and using a water filter. If you’re not keen on keeping up your equipment, you can always opt for more carefree models like the SteriPen or chemical treatments like Aquamira or Potable Aqua. Last but not least, we should mention that just about every water filter and purifier can malfunction, which may leave you without clean water in the backcountry. In this scenario, you can boil your drinking water provided you have a backpacking stove and extra fuel, but this a time and labor-intensive method. For this reason, we think it’s a good idea to carry a lightweight chemical treatment or LifeStraw as an emergency backup. 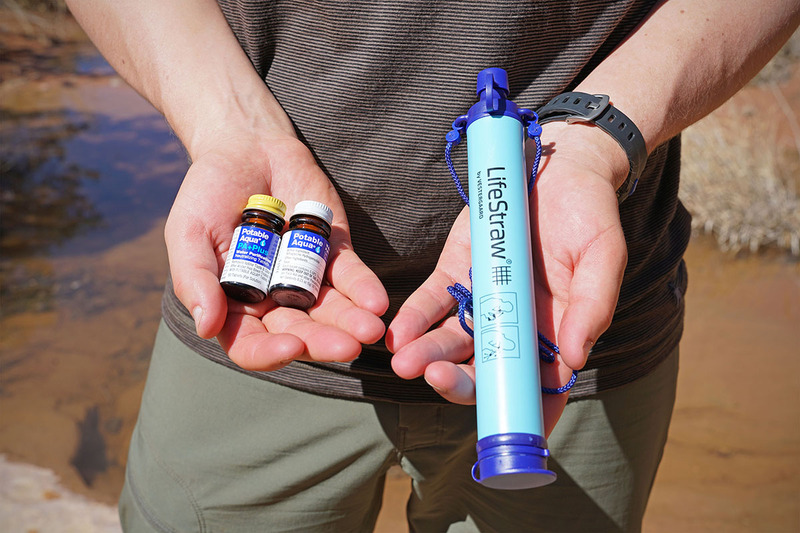 The LifeStraw weighs just 2 ounces and costs $20, and Aquamira drops are just $15 for enough solution to treat 30 gallons of water, for just 3 extra ounces in your backpack. Getting sick in the backcountry can be a serious medical concern, so we think having a backup is a smart way to go.